Dr. Paulk discusses stomach acid, indigestion and your thyroid. Hypothyroidism contributes to hypochlorhydria, a condition in which the stomach acid is too low. For someone with acid reflux or chronic indigestion this may sound like a good thing but in fact low stomach acid often causes heartburn, indigestion or GERD. When acid levels in the stomach are low the stomach cannot digest food thoroughly. The food in the stomach begins to rot and putrefy. The small intestine attempts to reject the rotting mess and the food shoots back up into the esophagus. The food is not acidic enough for the small intestine but is too acidic for the delicate tissues of the esophagus and causes painful heartburn and often gets diagnosed as GERD. This is why, after a meal that is heavy in protein you may feel that you have swallowed a brick. The standard medical approach is to prescribe medications to reduce stomach acid which may give temporary relief but tends to exacerbate the underlying problem and requires continued and increasing dosages of the medication. Hypothyroidism can contribute to low stomach acid and low stomach acid can also contribute to hypothyroidism. It is estimated more than 90% of the population suffers from low stomach acid due to poor diets of processed foods. These digestive malfunctions that stem from low stomach acid sets the stage for autoimmune disease, chronic stress or poor absorption of nutrients, all of which could lead to hypothyroidism. If you have been struggling with chronic indigestion, GERD, stomach acid or intestinal problems this could a warning sign that you may have undiagnosed hypothyroidism. 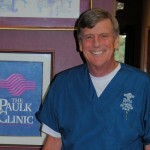 Dr. Phillip Paulk, DC is one in a long line of chiropractors in his family and has been practicing since 1976. Dr. Paulk’s great, great uncle, Dr. George Paulk, Sr. was a pioneer in chiropractic in Georgia being granted one of the first chiropractic licenses in the state in the 1930’s. Dr. Paulk is a Board Eligible Chiropractic Neurologist and has earned certification in Functional Blood Chemistry, Brain and Neurotransmitters, Mastering The Thyroid and is training in ADD/ADHD Spectrum Disorders through APEX ENERGETICS and The University of Bridgeport. He is certified in Chiropractic Biophysics, has been published in peer-reviewed medical journals and is currently working on his first book. Be sure to check out their website at ThePaulkClinic.com. Find them on Facebook, Twitter and Google+. Questions or anything to add about stomach acid? We want your thoughts in the comments section–Please!